I don't think there's anything more bittersweet than summer transitioning to fall. As much as I love summer, fall will forever be my favorite. Bring on the sweater weather, fall foliage, football tailgates, candles, and pumpkin flavored everything. So I know fall isn't officially here until September 22nd but I think it's the perfect time to start purchasing some fall decor. Check out my roundup of my favorite fall items below! 1. Happy Fall Ya'll Pillow. This is the perfect accent pillow to throw over a chair or your bed! The neutral soft colors don't break any color scheme you may have going on but still bring a feel of fall into your home. 2. Rustic Pumpkin Ceramic Candle. I love this candle!! I feel like the look of a candle is just as important to me as the smell. I don't care how great a candle smells - if it's ugly I won't want it in my apartment! This white and gold pumpkin is so pretty and it can be used as a decorative piece even after the candle burns out. 3. Hocus Pocus Box Sign. // Here for the Boos Box Sign. I relate to these on a spiritual level. These would look perfect on bar area or bar cart! 4. Chez Elle - Booze Decanter. I've posted this decanter in my BAR CART ESSENTIALS POST but I think this is especially perfect for fall too. The gold will most likely match your other fall decorative pieces and I think the 'booze' can be taken as the joke from the "Here For The Boos" Halloween pun. 5. Yankee Candle - Velvet Cream Pumpkin. ON SALE!!! And can you honestly ever have enough candles for fall? I think not. TJ Maxx is my #1 go to stop for candles! Doesn't Velvet Cream Pumpkin sound soooo perfect? I also like that this candle isn't orange - I try not to overdo the orange on my fall decor and opt for white and/or gold instead. 6. Trick or Treat Slate Tray.I am obsessed with this cheese/serving tray! I think it's so funny that as I get older I get excited over cute household items. This slate tray comes etched with the spider webs and the 'Trick or Treat' but you can add onto the design with chalk. This is so perfect if you're hosting a Halloween party. 7. Effie Faux Fur Throw. Time to trade in those bright colored/printed throws for some cooler neutrals this fall. This throw is so fluffy and soft and it's perfect to warm you on the cooler nights that are approaching quickly. 8. Honey Almond Hand Soap & Lotion Set. Don't get me wrong, I love all kinds of scented soaps and lotions but the fall scents are my absolute FAVORITE! Honey almond sounds like an absolute dream and the set in itself looks so cute together. 9. Happy Fall Marble Sign. I love this marble sign! Again, it is a perfect touch of fall decor without clashing with any current room scheme. 10. Faux Sunflowers in Pumpkin Pot. Oh man, do I wish I could have real flowers filling my apartment but I know my bank account would severely suffer so faux flowers are the way to go for me! These faux sunflowers in a pumpkin looking pot are such a cute and perfect touch of fall. 11. Witch's Brew Growler. This is another great item to add to your bar cart or even bring to a holiday party! 12. Drink Up Witches Dish Towel. Am I the only one who loves all these cheesy Halloween puns? This dish towel is amazing. When it comes to decorating with dish towels, all you really need is one 'accent' or 'holiday themed' towel and the other couple towels can be solid colors so it still looks festive without going overboard. 13. Turkey & Pie & Football LED Sign. If this doesn't sum up fall then I just don't know what does.I love this LED sign! 14. Pumpkin Spice & Everything Nice Mug. . Like candles, I just cannot have enough coffee mugs. I have a cupboard of matching set of coffee mugs but I dedicate a whole shelf to random funny/cute coffee mugs that aren't a part of the set. Pumpkin spice is my favorite so this mug couldn't be more perfect. 15. Sugar Skull Decorative Pillow. I don't know why but I love sugar skulls. I think they're so pretty! I have a colorful decorative sugar skull in my bedroom that I keep up year round :) Similarly, this sugar skull is a super cute decorative pillow not just for fall/halloween but year round too. 17. Eat Drink & Be Scary Napkins. I love having cute napkins that go along with the appropriate seasons. Is it weird that this makes me feel like a real adult? These napkins from Nordstrom are so cute! Life Hack: TJ Maxx always has such cute napkins for cheap. 18. Turkey Stand & Dip Cut Set. How cute is this??! It's not only a cute decorative piece but I think it would be a great gift for a host. You could keep this out all season and just keep filling with your favorite snacks. 19. Give Thanks Garland Banner. This garland is giving me some serious inspo to redesign my wine cabinet to fit a more fall theme. This would look so cute over a bar cart! 20. Hello Fall Coasters. I love having cute coasters but always forget to use them - anyone else with me on that? 😂 Good thing they look cute displayed on their own! 21. Come In & Cozy Up Doormat. I think this might be my favorite item on the list. I love cute doormats!! I like that this one isn't like obnoxiously Halloween/fall theme and instead it really works for fall and winter. 22. Pumpkin Bottle Stopper. How pretty are these?! Again, a perfect addition to a bar cart or gift for a host! 23. Blessed Picture Frame. I'm always feeling #blessed but there's just something about the holidays that really have me feeling thankful for how fortunate I am. This frame is obviously perfect year round but I think it's especially fitting for the upcoming seasons. 24. Copper Stemless Wine Glasses. I think I also posted these in my bar cart essentials blog post but I think they work so well with all the other items from this post! The copper brings a cool fall tone without being an obnoxious Halloween themed wine glass so you can still keep these out year round. All these fall picks are so cute! Thank you for sharing! Oh I want more candles right now! I'm loving all the rose gold elements to this. Amazing pieces. I absolutely love Fall decor! :) I'll take everything on this list. 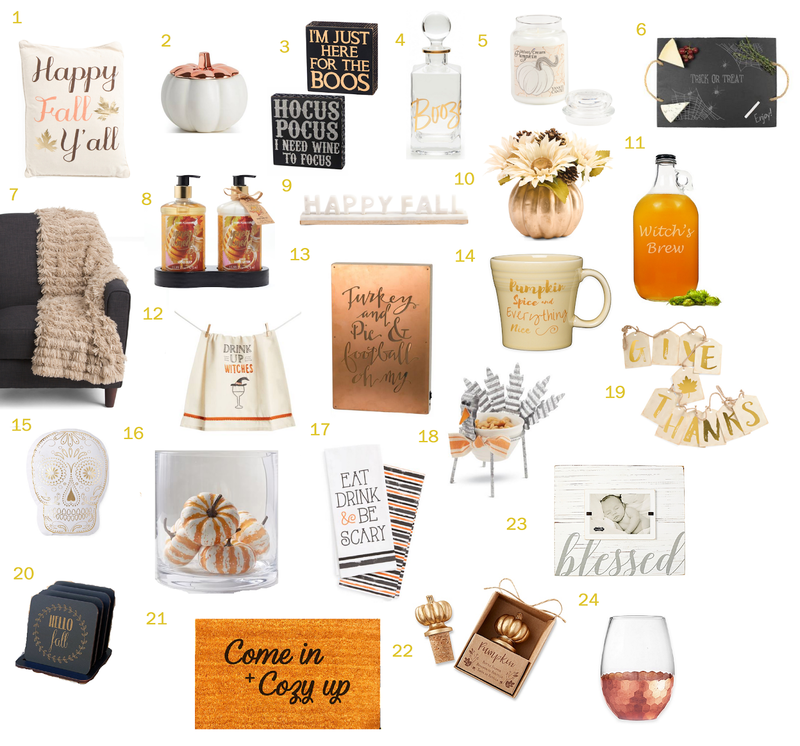 :) Really love the furry throw and the pumpkin bottle stoppers! Dang now I really wish it was Autumn here, Annoying being in the opposite hemisphere! Hahaha I feel ya girl! Love all of these especially that cute mug! omg, love the mat and the stemless wine glasses! Thanks girlfriend!! I neeeeed this mat! I'm getting all the fall feels!! I love all of these cute and cozy decor items you found! This is so cute. I want all the fall Devore or the best season to decorate and dress for! Happy fall y'all! You found the cutest Fall decor! I didn't think I needed any fall decor until I saw this post haha! lol I say this every year and always still end up buying a few new items - oops! I don't even know what would be my favorite item of these! Maybe the pumpkin candle? It's so cute! I'm a summer baby so I'm not as excited as you are about fall approaching but I do like your fall home decor. I especially like the faux fur throw and copper stemless wine glass. This seriously makes me so excited for Fall, one of my favorite times of the year! I love all the warm smells and cozy vibes Fall brings, especially fall candles! Check out my latest work outfit idea "The Modern City" to get some inspo! Fall is my absolute favorite season and all your picks are just so cute! I need to go shopping for fall interior decor soon! Ahh same :) Thanks, girl! Ahh this made me so excited for fall!! I saw that blanket (#7) on TJ Maxx the other day and I want it so bad! You found the CUTEST stuff! Yay! These make me so excited to decorate for Halloween! Hello Fall!!! I love summer because my kids are home from school, but I hate the heat. Fall will forever be my season of choice. I love these pieces you picked up.. the welcome mat one is probably one of my favs and I NEED that blanket! I love this!! I am obsessed with the doormat and all this festive fall décor. Something about fall and winter and décor and holidays and decorating just makes me so happy. Thanks so much for sharing I seriously wish I could buy it all to make my apartment perfect for fall. Would love to see one for Thanksgiving décor and Christmas/holiday décor.